There is something decidedly compelling and emotional about a faux wood paneled digital alarm clock. Four digits beam seven segment LED figures, recalling dated bedrooms in muted tones and economy aesthetics. In deference of kitsch, nostalgia! This is my initial reaction to Michael E. Stephen’s tower of intermittently blinking identical alarm clocks at Midnight Rainbow, a solo exhibition featuring Stephen’s work at Pump Project, a nonprofit 501(c)3 art complex in East Austin. Here, a multitudinous singular alarm clock, recently classified relic of temporal restraints, collected by the artist and stacked linearly up from the floor, a disarray of dark brown cords tethering it to the wall. “I used to have that alarm clock!”, reverberated. The piece, Untitled (2016) proves a rather poignant summation of the show. As found object artworks implicitly do, the piece re-contextualizes a familiar everyday item(s) within the presumably disparate art viewing context. Form, function, viewing relationships, and aesthetic qualities transmute. Stephen recalls and repeats a normalized commodity—the alarm clock—from two decades earlier, selective for its archetypal qualities. It is an object so deeply imbued with personal nostalgias and cultural reverence that it acts as both a signifier for individual histories and a pictorial icon. Psychological experience and cognitive recognition are simultaneously affirmed. Similarly, “Midnight Rainbow, golden era” (2016), namesake piece of the exhibition title, implicates analog Video Home System (or VHS) as another dated consumer level technology re-contextualized. 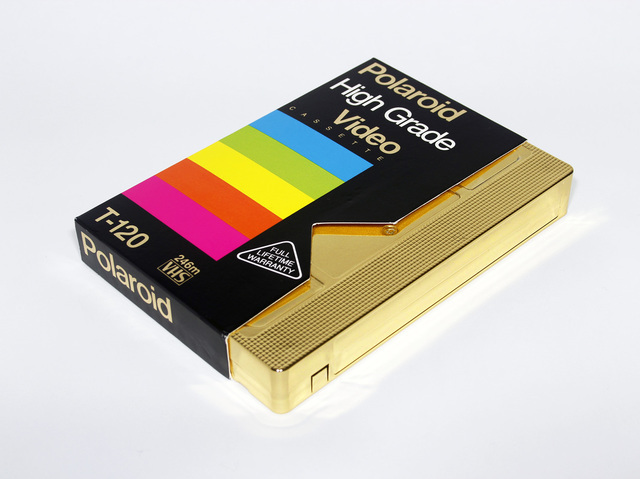 Didactically speaking, “Midnight Rainbow, golden era” is a blank High Grade Polaroid VHS cassette plated in 24k gold. It is displayed on a white shelf at standard pedestal viewing. Its resonance is nearly identical to that of the alarm clock piece; nostalgia, formal interest, amplification of early technologies, and visual fetishization are recurring motifs. However, Stephen’s use of gold plating implicates a separate, market based system of value, not dissimilar from that of medieval religious icons in which works were quantified by the significance of devotional icons represented and amount of gold present in the work. Through application of a rarified market material, Stephen disavows the real life application of the VHS, it’s ability to hold visual information, and ultimately elevates the VHS’s worth as a commodified art object. This type of value exchange of the found object by the artist also recalls commodity sculpture of the 1980’s, a variation on the “found object”, wherein commercially mass produced items are arranged in an art gallery as sculpture. Supposing that Stephen recalled this mode of working through use of 80’s-centric-objects delineates a retroactive mode of practice which, although interesting contemporaneously, seems intellectually underwhelming. The remainder of work in Midnight Rainbow likewise proceeds as such; a cast black rose composited of incinerated blank VHS cassettes and diamond dust hangs upside down on the back wall, a large black frame contains the tiny white fleck of an auctioned “piece of moon”, and—nearly out of sight—a 4x6 image of Elvira and a preserved giant moth occupy the only space in the middle of a white wall. Hanging some ten feet up, I saw this only upon exiting. Cold Black (2016), is perhaps the most spatially interesting work. Two nearly pristine 80’s RCA VHS video cameras on thin tripods stand facing each other in the center of the room, their open lenses pressed together to hold a single, square, reflective black pane. With mirroring already enforced by the physical reality of the two RCA video cameras facing each other, the black glass engages a nearly theatrical iteration of mirroring, the individual camera’s each reflected once more onto themselves. Although the formal effect is appealing, it’s functionality does not corroborate conceptually; one cannot help but sigh heavily at yet another overwrought aesthetic illusion. While the exhibition retains all the nuanced austerity of contemporary aesthetic glory; sparse while walls, restrained artwork inclusion (Midnight Rainbow was comprised of a total of five pieces), limited didactic information, and off kilter curatorial spatial organization, the overarching result of the exhibition is that of an expensive parenthetical Craigslist acquisition, wherein aestheticized 80’s artifacts have been collected, re-commodified, plated in gold, framed in glass, and re-cast with diamonds. Stephen’s concise amalgamation for eighties video lore and cultish tendencies is certainly worth seeing, if not for the sheer anthropological quest of it all.